Members & Guests: Wednesday – Saturday 6 pm to close. Last dinner seating at 10 pm. Open to the public: Sunday Brunch 10 am to 3 pm. Last brunch seating at 3 pm; kitchen closes at 3:10 pm. Available for events at all times. 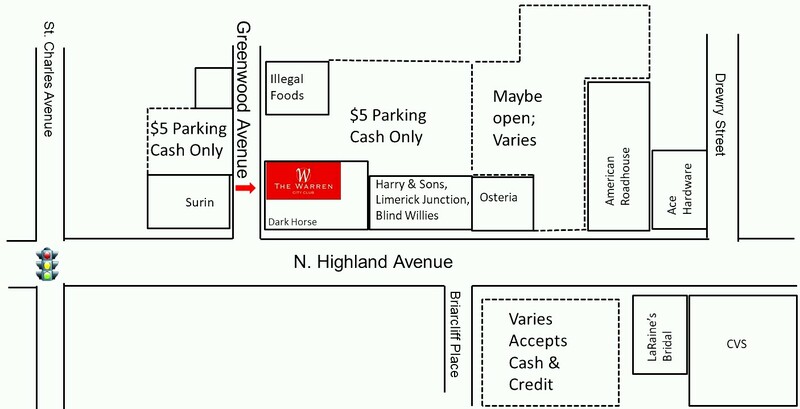 The Warren is located on the 3rd floor of the building at the corner of Greenwood & N. Highland Avenues (houses Dark Horse Tavern on ground floor). Enter from the SIDE STREET: Greenwood Avenue. Look for our sign hanging on the building just at our entrance. Walk up onto the patio off Greenwood, turn left & walk up the stairs. Please note, our street address, 818. N. Highland Ave, is posted on the front of the building; this is not our entrance. It is there because of a City of Atlanta Fire Department regulation. The lots behind our building and behind Surin are managed together. The rate is usually $5 and they accept cash only. We do not recommend parking on the streets as the meters are difficult to manage and unreliable. Please, do not park in the Atkins Park neighborhood or any of the taxi stands. On Sundays, street parking and the lots behind The Warren are available at no charge. The Warren is at the next intersection, which is Greenwood Avenue and North Highland Avenue. We are on the top floor of the building that houses the Dark Horse Tavern on the first floor. Our entrance is off of Greenwood Avenue at the rear of the building. Look for our sign hanging from the side of the building. There is a small patio; step up onto it and turn left. Go to the top of the stairs to The Warren. The Warren is on the right at the corner of Greenwood Avenue and N. Highland Avenue, which just is past the CVS and the ASTA parking lot, which are on the left. We are on the top floor of the building; Dark Horse Tavern is on the first floor. Our entrance is off of Greenwood Avenue at the rear of the building; there is a small patio. Step up onto the patio and turn left. Go to the top of the stairs to The Warren. Take Peachtree Street South towards Downtown. Turn right onto Monroe Drive. Take an immediate left onto Virginia Avenue. Proceed to the intersection of North Highland Avenue. The Warren is on the right at the corner of Greenwood Avenue and N. Highland Avenue, just past the CVS and the ASTA parking lot, which are on the left. Take Peachtree Street north towards Midtown. Turn right on Ellis Street, which becomes Freedom Parkway (GA-10 East). Cross Piedmont Road and Boulevard. Take the GA-42 East ramp toward the Carter Center. Stay straight and proceed on the GA-42 Connector East/Freedom Parkway. Turn left at the light at N. Highland Avenue. Cross North Avenue, Ponce de Leon Avenue and St. Charles Avenue. Take I-85 North towards I-75 North and Atlanta, roughly 9 miles. Take Exit #248C, which is the GA-10 East/Freedom Parkway, to the right off of the interstate. Turn right onto Freedom Parkway at the top of the exit and follow sign toward the Carter Center.